When the Arizona Department of Water Resources held a “Junior Hydrologist Day” recently for the children of staff, the room was filled with the kind of hands-on, interactive stuff that kids love. 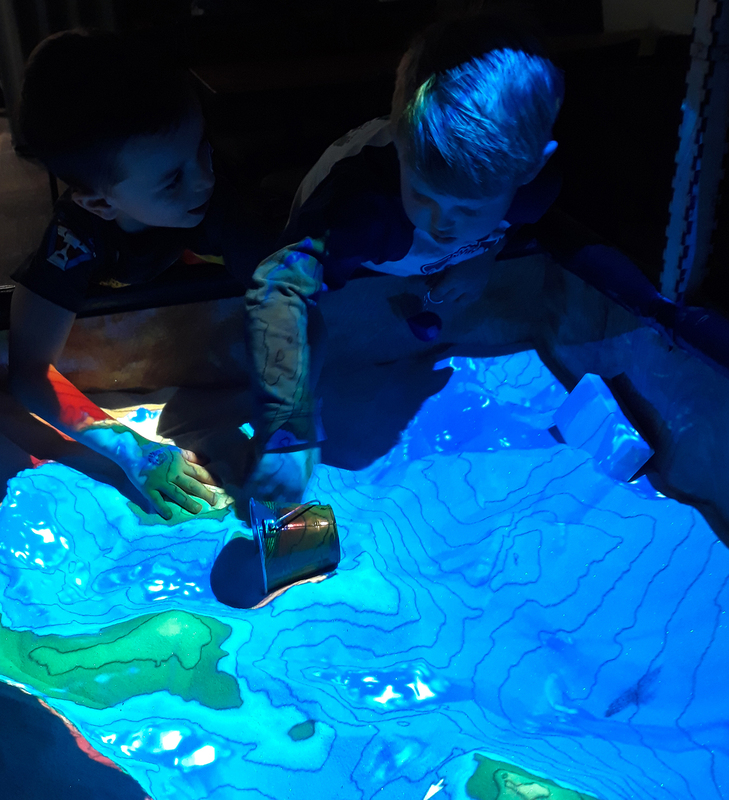 The kids were wowed by the Augmented Reality Sandbox, or “AR Sandbox,” which allows users to create topographical models by shaping real sand. The new, re-shaped topography is then “augmented” in real time by an elevation color map, topographical color lines and simulated water that “flows” in accordance with the contours of the land, just as it does in the real world. 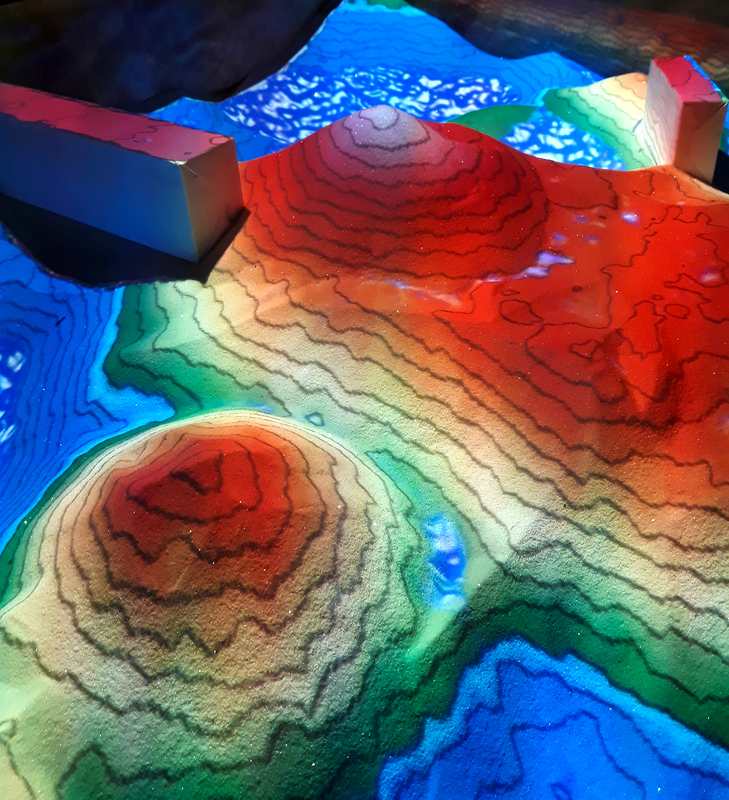 As described by the creators of the AR Sandbox at the University of California Davis, the sandbox system “teaches geographic, geologic, and hydrologic concepts such as how to read a topography map, the meaning of contour lines, watersheds, catchment areas, levees” and other elements of nature that help determine the relationship between land and water. 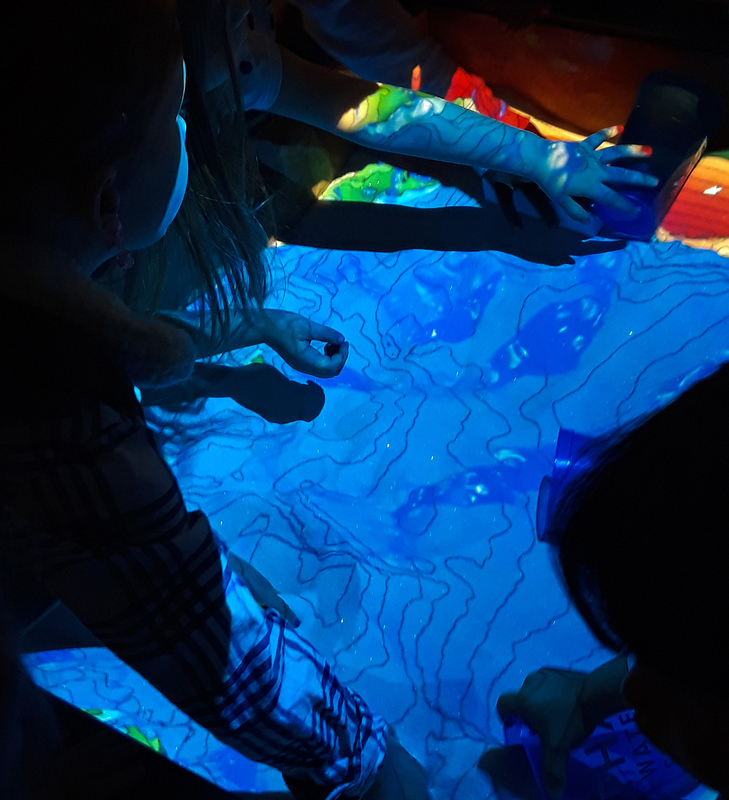 The AR Sandbox is the result of a project on informal science education for freshwater lake and watershed science funded by the National Science Foundation. The software is the creation of Oliver Kreylos of UC Davis. Recognizing the popularity potential of the technology, the UC Davis researchers released the technology as “open source,” rendering it available for free to all who wanted to employ it. As a result, AR Sandboxes have proliferated around the world, including dozens in the U.S. and at least five in Arizona. The AR Sandbox that so mesmerized ADWR’s junior hydrologists was built by Milton Williams (BIO), who created the sandbox from scratch, including woodwork, framing and hardware setup. ADWR Hydrologist Justin Clark borrowed the AR Sandbox from Williams for the department’s Junior Hydrologist Day event. Clark worked with the Department’s IT group to configure a high-performance computer to run the sandbox software. Rogelio Martinez and Scott Selin of ADWR were instrumental in getting the sandbox onsite and set up for the young, aspiring hydrologists to investigate. While the opportunities created by augment reality products for doing real science appear limitless, there also are opportunities for accomplishing things that scientists rarely consider… like marketing the intriguing, exciting nature of science itself in appealing ways to potential scientists and to the public at large.